Setting clear, measurable goals is essential for helping a child with autism make progress in and out of the classroom. 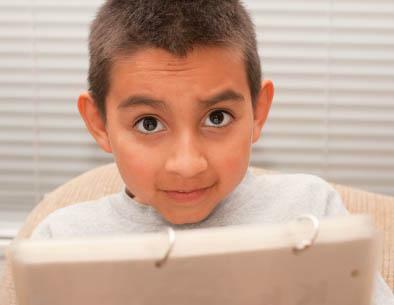 The child's individualized education plan (IEP) consists of several goals for various areas of challenge for the child. When it is time for your student's IEP meeting, you can bring your own goals to incorporate in the plan. Your school district will have a meeting once a year to form the details of the child's autism IEP, and whether you're a parent or a teacher, you'll be encouraged to attend this meeting. At the meeting, you'll hear about the child's progress on last year's goals, and you'll have a chance to offer any goals you'd like to see added to the next year's IEP. Measurable: The school district needs to document proof of the child's progress, so it's important that the goals are something they can measure. Specific: General goals are too hard to document, and it's easy for them to get overlooked. The best IEP goals are very specific. Applicable: The goals in the child's IEP must apply to your student, not to autistic children in general. If your student has a medical diagnosis or educational label of autism, chances are good that he or she deals with challenges in the areas of communication, social skills, and behavior. Additionally, many children with autism also struggle with fine motor skills and sensory issues, which are usually addressed with the help of an occupational therapist. Be sure to include all of these areas when you make a list of goals for your student with autism. 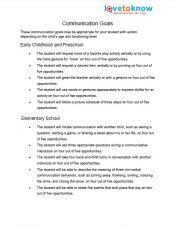 Print example communication goals for autism. Typically, a speech therapist will help your child achieve communication goals. The goals in this printable are divided by the student's age or grade level. Many children with autism have "splintered" communication skills, which means they may excel at some areas of language, such as vocabulary, while being very delayed in other areas, like non-verbal communication. 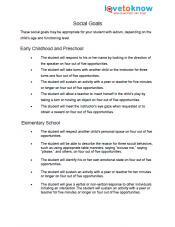 The speech therapist will have many great ideas to help, and these goals are simply a good place to start. Print these example social goals. Social skills are an area of challenge for most students with autism. From initiating an interaction with peers to understanding the finer points of body language, your child may struggle to navigate the social world. Choosing developmentally-appropriate goals can make all the difference. 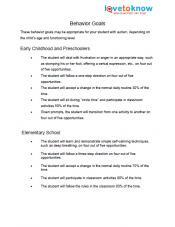 Print examples of behavior goals for autism. Students with autism often struggle with repetitive behaviors, stim behaviors, attending to the teacher, and acting out when frustrated. If these behaviors interfere with your child's ability to function in the school, his or her IEP may include some behavioral goals. Print example OT goals for autism. Many students with autism are also over- or under-sensitive to common stimuli. The lights in the classroom may be too bright for your child or there may be too much noise. Perhaps your child craves spinning or running into things. The OT will work to make sure these sensory needs are met in practical ways within the classroom, allowing your child to focus on learning. If you're a parent of a child with autism, it's important to remember that no one knows your child as well as you do. You have a very important role when it comes to developing IEP goals. Take some time before the IEP meeting to make a list of areas where you feel your child needs help. 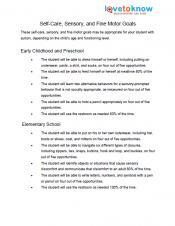 Then peruse the printable IEP goals listed here, and select some goals for your child. Your child's education team may have suggestions for modifying these goals as well, and it's important to listen to their professional perspectives. Ultimately, the goals your choose will be a mix of your own goals and those of the education team.